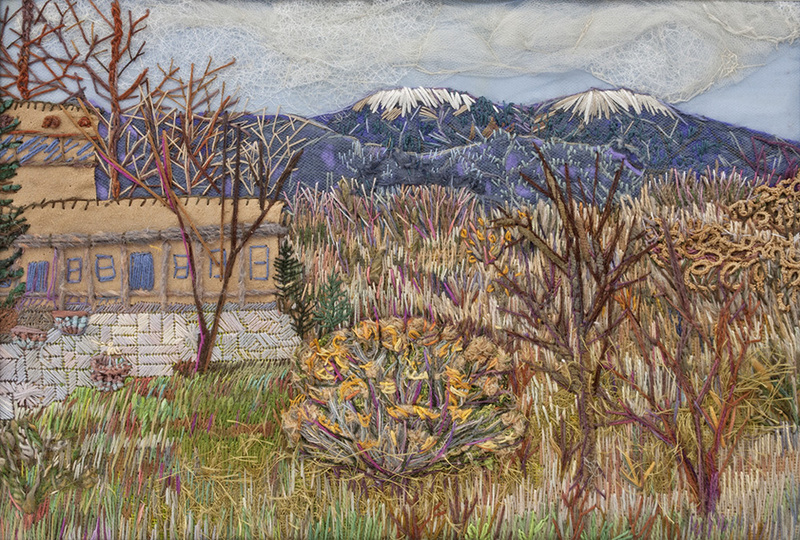 This piece reflects my memories of an EGA Fiber Forum retreat with Jan Beany and Jean Littlejohn in early spring in Taos, NM. As a native of a Great Lakes state which is very green and very flat, the mountainous high desert of New Mexico presents an entirely different feeling and color palate. I am used to the blues and greens of fresh water and forests. I became infatuated with the chimera (rabbit brush). The trees, as scarce as they were, had not yet budded; but the chimera added color because of its gray branches and dried yellow flowers. Hence, a Chimera created by free motion machine embroidery on a dissolvable ground stands in the foreground. I loved the way this plant retained its color throughout the winter.